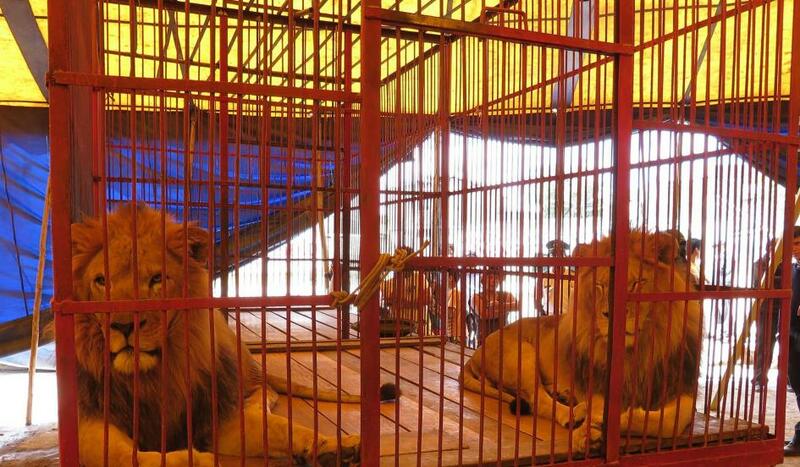 What Happens to the Animals When the Circus Leaves Town? Smith was destined for execution. The lion had already been castrated, declawed, separated from his mate, Amazonas, and caged with another male’s offspring. He was agitated. Then one day in August 2014, during a circus performance in Peru, as he sat perched on a pedestal above a spectator’s head, which was lowered, exposing the back of her neck, the trainer commanded Smith to jump, and his natural instinct prevailed. He pounced on the audience member, grabbing her in his jaws and dragging her around the ring until a handler beat Smith into submission and forced him back into a cage. The spectator survived, but the incident triggered an outcry for the lion to be euthanized, says Tim Phillips, vice president of Animal Defenders International. His group countered by pointing out how it was people, not Smith, who had acted recklessly and violated a law banning wild animals in circuses. ADI successfully pleaded with Peruvian authorities for Smith’s life to be spared and, with law enforcement’s help, the group returned a few days later to seize the lion from Circo de Monaco. “The world would be appalled if a lion is effectively murdered for what comes naturally when it was human beings and the circus being completely irresponsible and stupid,” Phillips says. In addition to Smith, 32 lions and about 60 other animals have been recovered from circuses in Peru and Colombia over the past year—following bans on the use of animals in circuses in those countries—as part of ADI’s Operation Spirit of Freedom. In some cases, the organization and the Peruvian government worked together to accept and relocate recovered animals, while other times they had to free the animals from circuses that refused to let them go. The rescue portion of the nearly $1.7 million operation was completed this July. But freedom isn’t enough. These animals need an adequate place to spend the rest of their lives, and one that’s not “in the wild.” Animal activists can expect to encounter this challenge more often as governments continue to crack down on the use of animals in circuses; 40 nations have now outlawed this practice to some degree. (In the U.S., circuses are allowed to use wild animals in acts, though the Animal Welfare Act of 1966 provides some minimum standards for the care of animals in traveling exhibits.) The stakes are high: Without a rescue group such as ADI assisting with logistics, these animals would likely be euthanized or put in zoos possibly without the infrastructure to accommodate them, or bans would simply go unenforced by overwhelmed authorities.